As the film Titanic ended, everyone in the packed movie theatre sat motionless in hushed silence. A girl suddenly erupted into a choking cascade of tears while the rest of us madly fought back ours. James Cameron’s impossible dream had come to fruition leaving a global audience spellbound. Many would go on to see it multiple times at the cinema and experience the full thrust of James Cameron’s exquisite poetry in motion. Titanic is an epic masterpiece about the beautiful but engaged aristocrat Rose meeting and falling in love with struggling artist Jack aboard the decadent unsinkable ship, Titanic, on its maiden voyage. The talented Leonardo Di Caprio and radiant Kate Winslet literally sparkle onscreen as spirited Rose and irresistible Jack with an incandescent chemistry that is fascinating to watch. Not only is their relationship believable but it is life-changing for both of them. Witty dialogue, fiery characters, a glorious luxury setting, heartfelt love story and the impending disaster as the Titanic looms closer to a massive iceberg keep the audience hypnotized until well after the credits roll to a gut-wrenching soundtrack. Being the researcher, writer, director, producer and editor, James Cameron was able to plaster his captivating vision across every aspect of the film. The pieces all fit together beautifully and the diamond clad storyline and characters are a testament to Cameron’s tireless work ethic on this film both well before, during and after production. In fact, the history of the making of this film and how James Cameron sacrificed everything he had physically, mentally and financially (forfeiting his director fees and his profit sharing points), essentially working himself into the ground for no pay over three years to finish the film, is an inspiring story in itself. Cameron’s passionate unwavering belief in his vision saw him fight as though it was a life and death situation to finish the film (and perhaps for him, it was). To understand Cameron’s attachment to story and the making of this movie, it is relevant to remember that long before production began, James Cameron made his first dive to the actual 1912 Titanic shipwreck and was so emotionally affected he shed tears. Cameron’s connection with the personal stories of the individuals who perished when the Titanic unexpectedly sunk in 1912 is powerfully reflected in the movie and goes further to explain why he was able to write and direct such an emotionally stirring film. I have never seen so many people leave a cinema so affected after Titanic first screened. The mood was accentuated by the haunting Titanic theme song that sounded throughout the credits. When Titanic was finally released and became the highest grossing movie ever at the time, it was only right that Fox eventually made the decision to gift Cameron a large figure (tens of millions) to compensate him for all his effort - no doubt to ensure he would work with them again in the future. It was a good decision by Fox, because James Cameron created and directed Avatar for Fox in 2009, which smashed box office records once again and grossed over two billion dollars world-wide. Titanic (1997): Written and Directed by James Cameron, Produced by James Cameron and Jon Landau, Edited by James Cameron, Richard Harris and Conrad Bluff, Music by James Horner, Cinematography by Russell Carpenter, Starring Kate Winslet, Leonardo Di Caprio, Billy Zane, Kathy Bates, Bill Paxton. 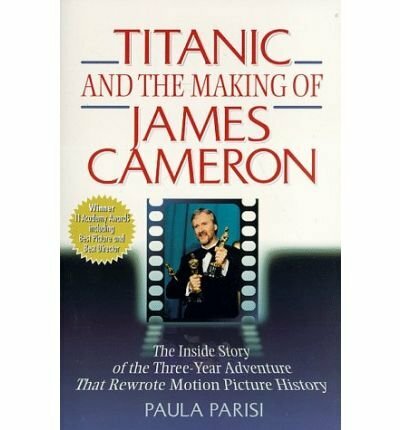 Source for information regarding James Cameron and Fox: Titanic and the Making of James Cameron by Paula Parisi. The book ‘Titanic and the Making of James Cameron’ is an absolute gem and a must-read for anyone interested in the hell James Cameron went through to get this film to the screen and the sacrifices he made that drained the life out of him in the end. To quote the books blurb on the back cover: ‘this is the story of obsession, passion and one man’s visionary quest for perfection’. Cameron invited Paula Parisi to document the three year making of the film and this book is a result. I personally found it very revealing and highly recommend it. As the film Titanic ended, everyone in the packed movie theatre sat motionless in hushed silence. A girl suddenly erupted into a choking cascade of tears while the rest of us madly fought back ours. James Cameron’s impossible dream had come to fruition leaving a global audience spellbound. Many would ..